Remember when MySpace and Facebook were only used by cyberstalkers and pedophiles? In a groanworthy turn of events the Vatican is approving of social networking sites. In fact they launched their own YouTube channel today. 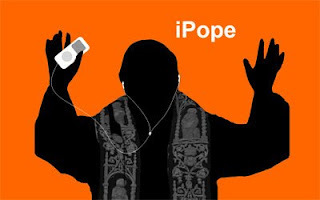 "The Vatican, which has had its own website since 1995, also recently endorsed the iBreviary, an iTunes application to put daily prayers on iPods and iPhones." Source. Lets just hope Apple is tithing. oh thank you for the laugh!